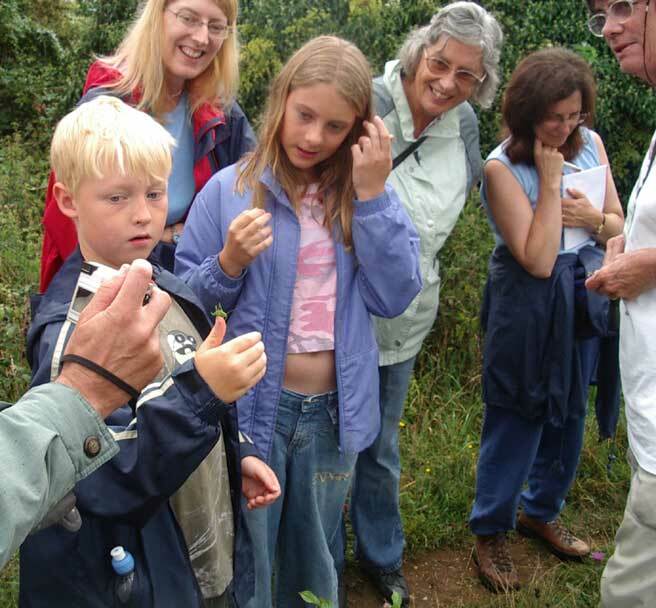 A Clouded Yellow Butterfly was seen at Upper Beeding. 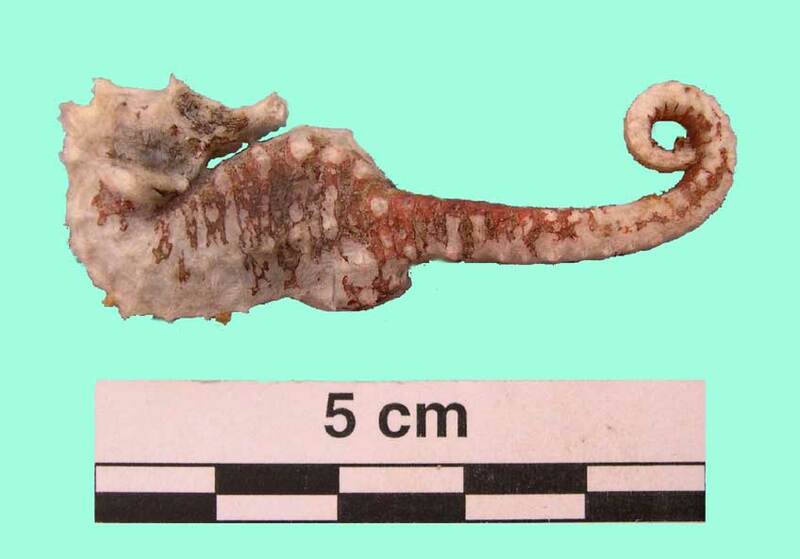 A Whiting was caught on rod and line four miles out of Brighton, Sussex, and it promptly regurgitated a Seahorse, Hippocampus sp. Seahorses are not known off the Sussex coasts, although I have received at least one unconfirmed sighting before. 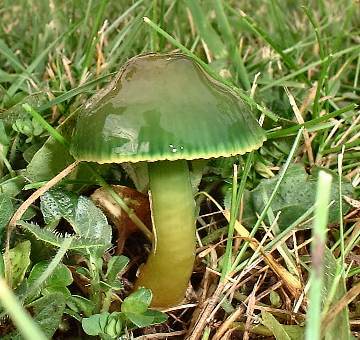 The green mushroom (in the photograph on the right) found on a lawn in south Lancing has been identified by members of the Fungi of the British Isles (Yahoo Group) as one of the wax caps, the frequently encountered Parrot Wax Cap, Hygrocybe psittacina. This is the first record on these web pages though. Although common it is small and merges so well in with the lawn and herbs that is inevitable missed by the casual passer-by. 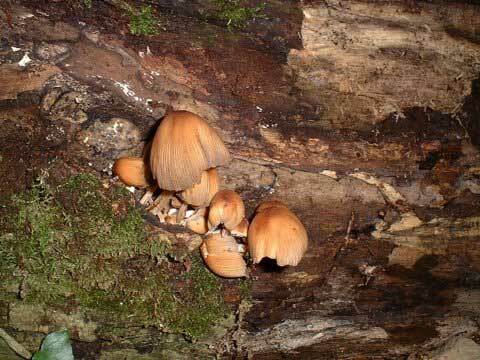 Mushrooms were encountered in the most unexpected places almost treading upon them before they stood out. 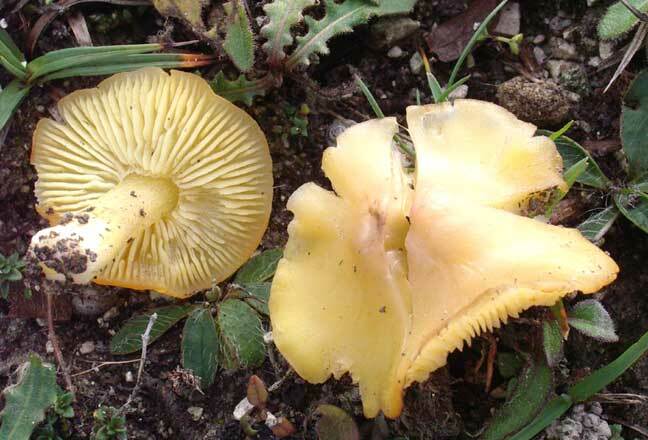 This mushroom is the Golden Wax Cap, Hygrocybe chlorophana. 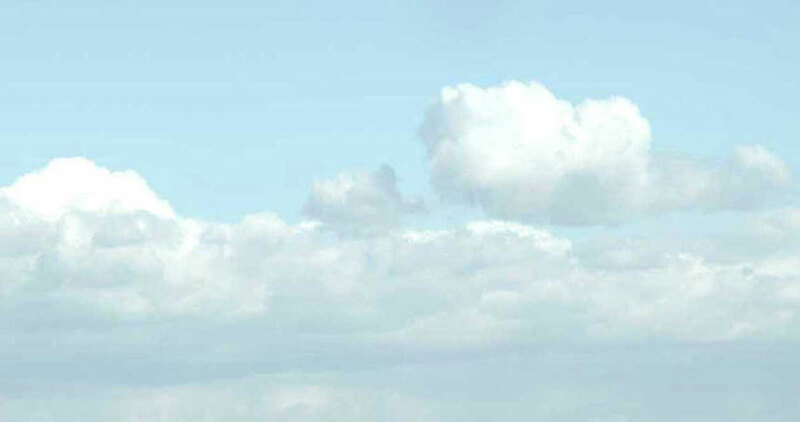 They were discovered on the A27 road embankment just east of the bridge section where it crosses the Waterworks Road. 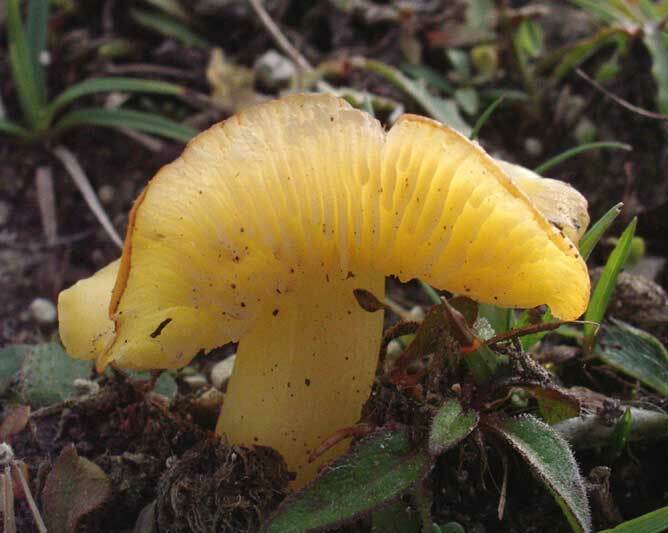 The Dune Wax Cap, Hygrocybe conicoides, was discovered nearby as welll as the poisonous mushroom Clitocybe possibly dealbata. I spotted a blue butterfly fluttering around a sun bathed garden in North Lancing. I'd guess it was a very late third brood Holly Blue Butterfly. 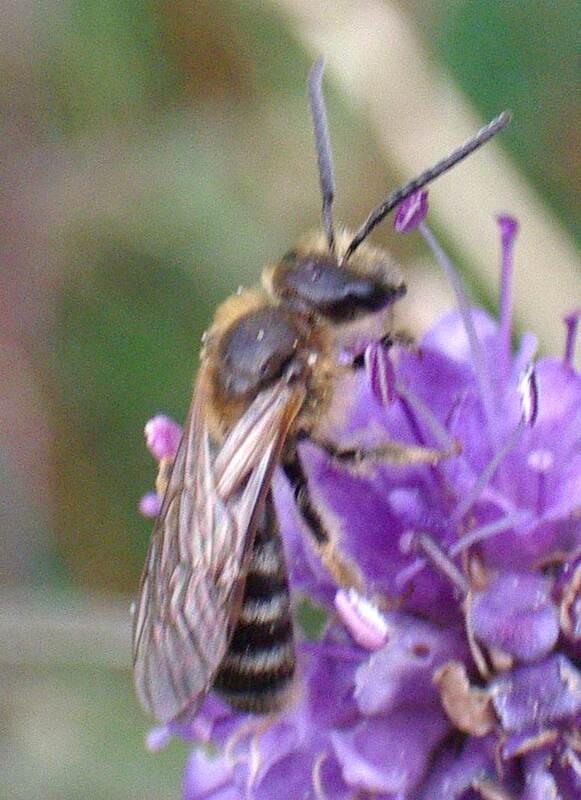 A solitary bee discovered nectaring on Devil's Bit Scabious on the lower slopes of Mill Hill could be one of several species and is not yet identified. The consensus on the British Insects (Yahoo Group) is that this small bee is a species of Lasioglossum, and not a Colletes. The solitary bee is Lasioglossum xanthopum - the largest British species of the genus, with males that peak much later than any other species. 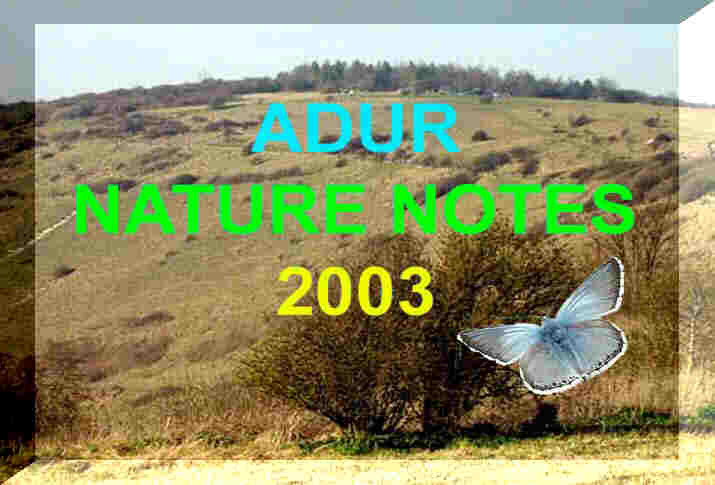 It is a rather calcicolous species and frequent on the Sussex downs. It is graded Nationally Scarce at the moment. Thunder rumbled and sheet lighting flashed as the black clouds rolled in with the Strong Breeze (Force 5) gusting to Gale Force 8, from the south-west. Rain squalls were intermittent and brief. At the western edge of Adur Recreation Ground, the White Poplar had already lost most of its leaves (a few silvery leaves could be seen on its crown when viewed from due east), whereas at the same time last year they mostly adorned the distinctive tree. After the recent rain, the western slopes of Lancing Ring were so slippery that walking was much slower than usual with ordinary flat soled shoes and not proper walking boots. 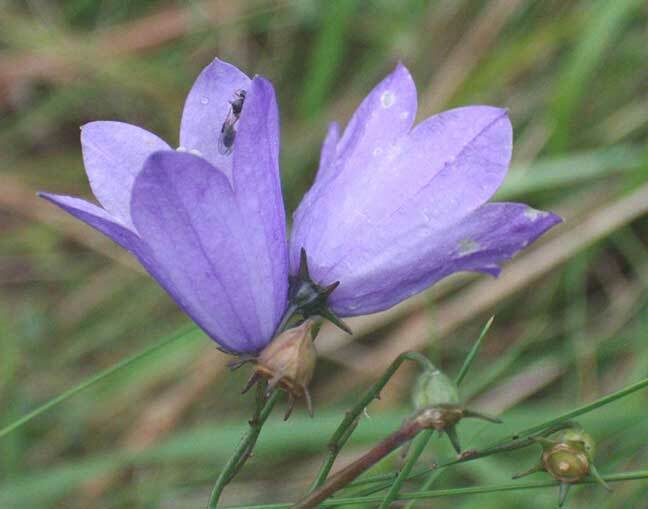 A dozen plus Harebells were still in flower amongst the long grasses. 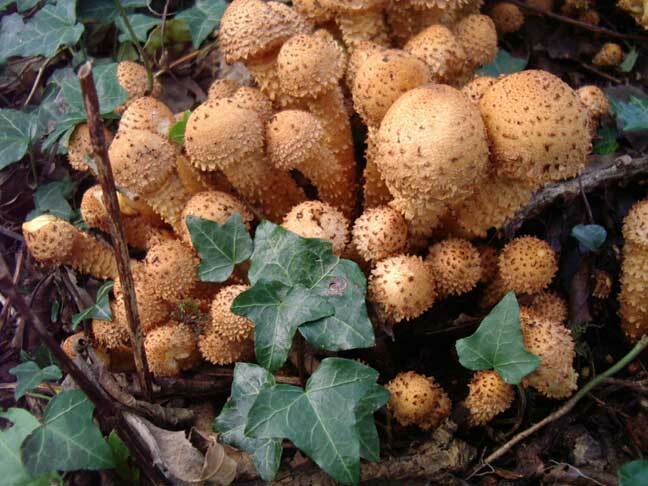 It would need an experienced mycologist to identify the species of the fruiting bodies of the variety of mushrooms and toadstools on Lancing Clump and the numerous others that are found in the meadows. 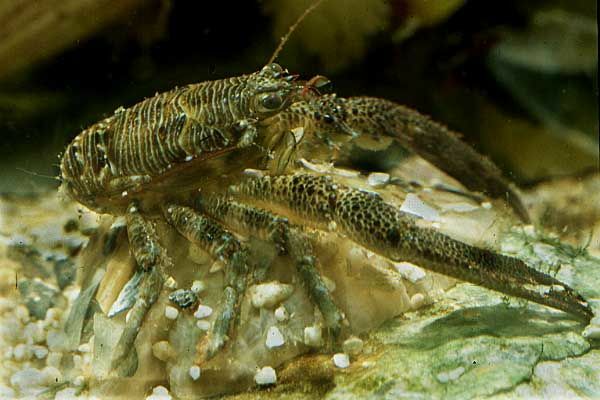 If you want to try your hand at identification, the images can be found on the following web page. Click on the text and wait for the images to slowly appear. On a mild October day under an overcast sky, there was a typical and wide selection of the usual fungi from large to small mushroom and toadstools in the Beech wood at Lancing Clump and amongst the meadows. 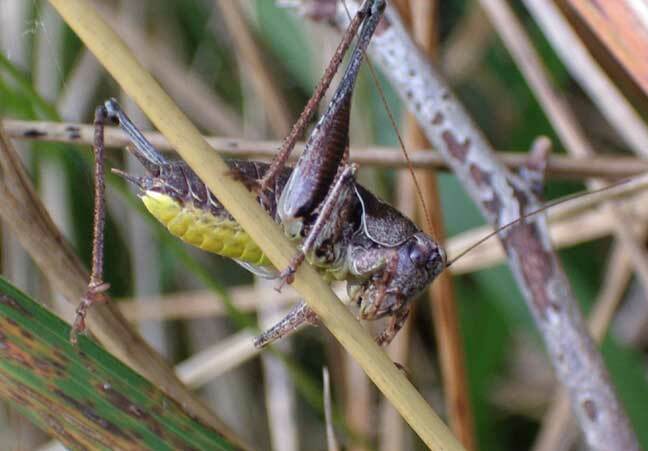 Katherine Hamblett heard the chirping of a male Dark Bush Cricket, Pholidoptera griseoaptera, with a distinctive yellow abdomen. 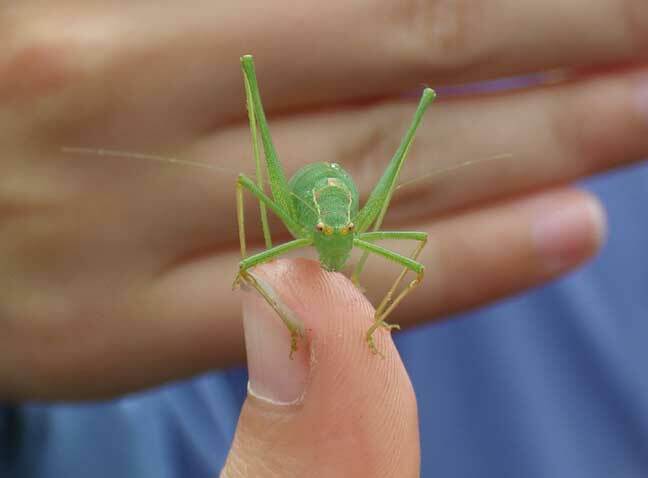 This is a common insect but it is not heard so often. 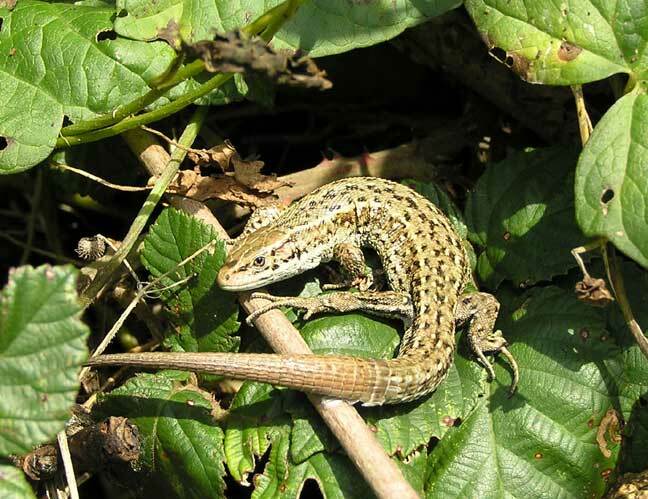 A Common Lizard with a regrown tail was discovered in the meadows of Lancing Ring. As an ominous black cloud rolled in from the west and made the darkness set in early, it was the pools underneath the groyne to the east of the Launching Ramp (5) that produced the most life on a low early evening spring 0.5 metre tide on Kingston Beach (Shoreham Harbour). 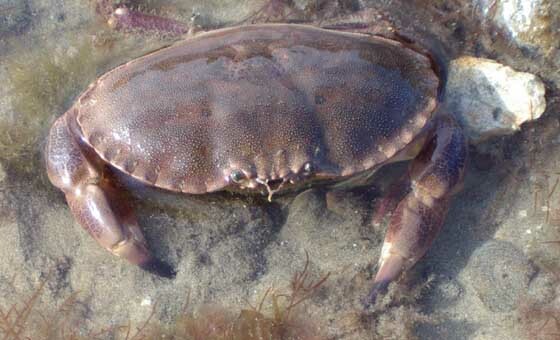 The Squat Lobster and Edible Crab (shown in the photographs above) are frequent intertidal inhabitants on the Sussex seashore, but they are only occasionally discovered on this semi-estuarine beach. Bullheads Taurulus bubalis, were at least half a dozen in the small pool underneath the groyne, and this is more than had been netted all summer, when this juvenile fish are usually so prevalent as to constitute a bit of a nuisance. 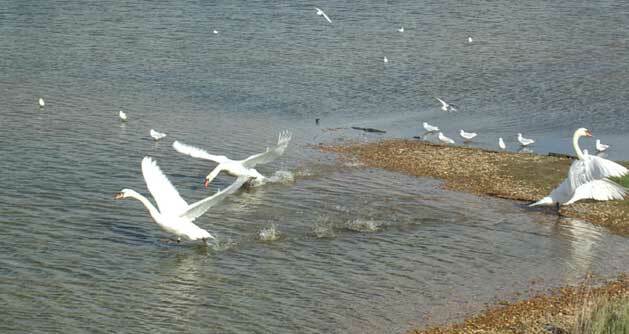 A pair of Mute Swans flew over Kingston Beach from west to east as dusk descended. 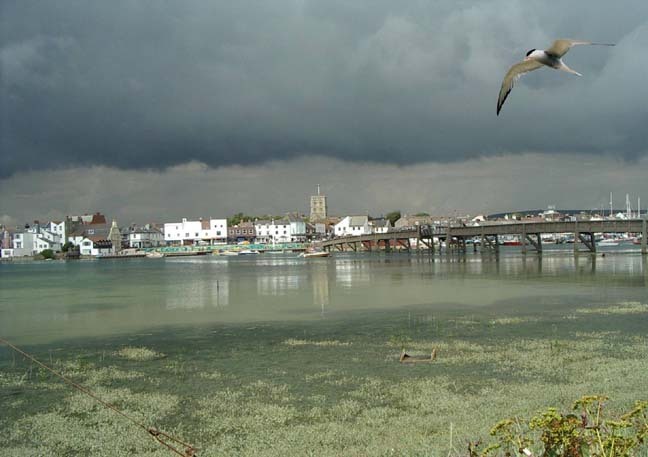 As a high spring tide filled up the River Adur estuary around midday, a few hundred Lapwings rested on the green grass of Shoreham Airport. 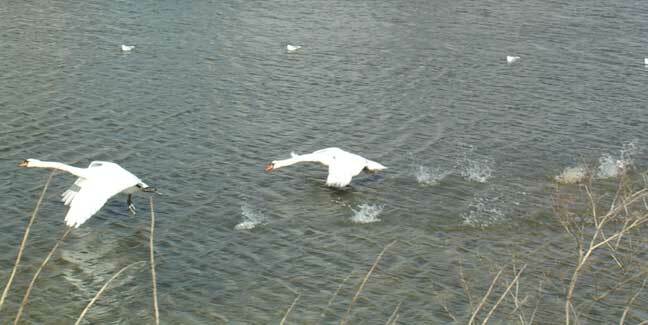 A couple of Mute Swans appeared to be having a bit of a barney in the shallows of Widewater Lagoon at the eastern end. These may have been a quarrel with intruders. This years' cygnets are still greyish in colour. 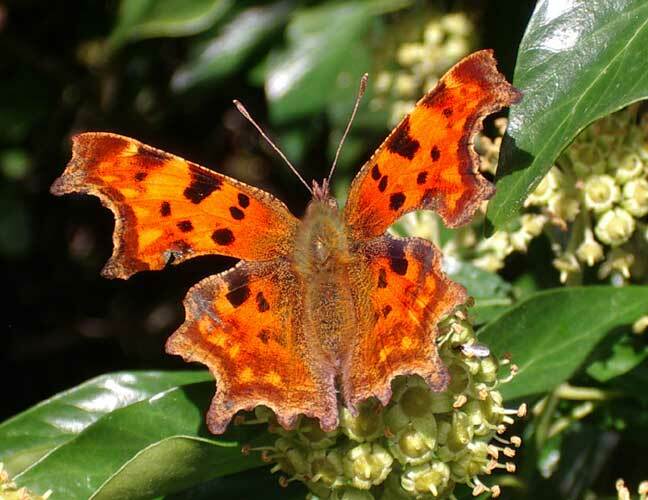 Only one butterfly was seen on the upper slopes of Mill Hill, and this was a Comma in a glade south of the upper car park. An adult Roe Deer was seen in the narrow overgrown field next to the stream by the Steyning Road through the binoculars from the top of Mill Hill. Early morning and their was a chill in the air with the temperature falling to 10.2 ºC, only rising to 15.5 ºC despite the sun being out in mid-afternoon. 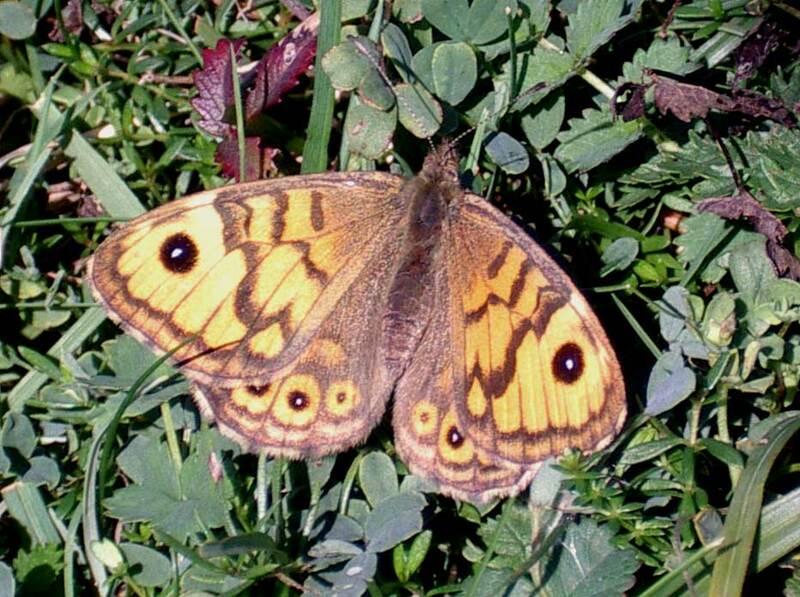 Could this explain the dearth of butterflies? 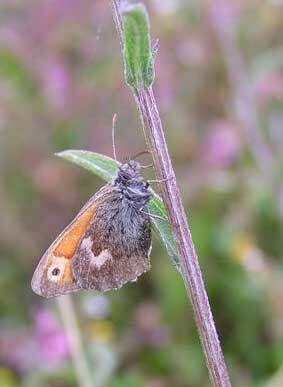 Just a handful of Meadow Browns at the northern end of the lower slopes of Mill Hill and a Clouded Yellow Butterfly. 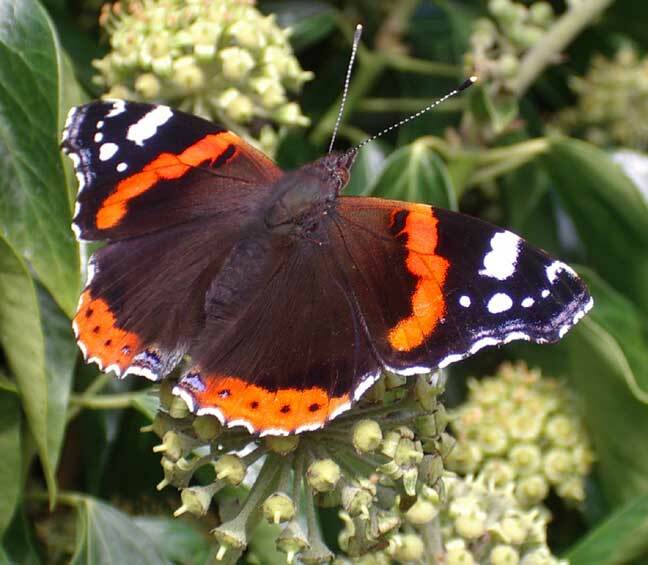 On the footpath approach to Mill Hill from the Waterworks Road, the sun was out but there was some many bees, wasps, flies and hoverflies that only one Red Admiral Butterfly found a place to settle. The total number of butterflies for the day fell to about twenty actually seen of just five species. 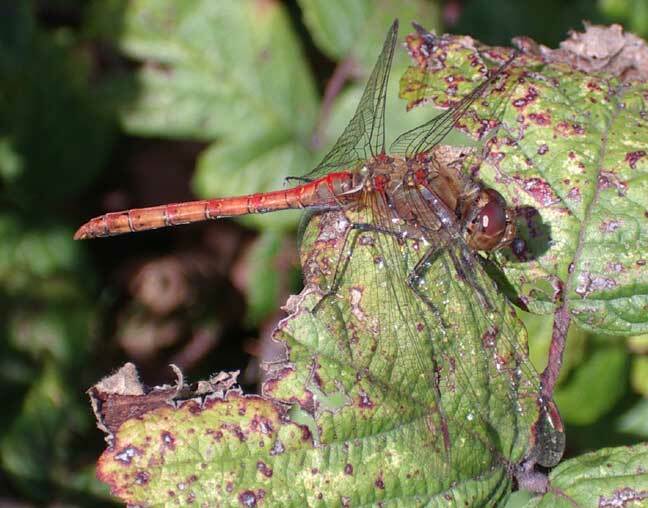 They were replaced by Common Darter Butterflies with over fifty seen on the day, mostly on the downs. 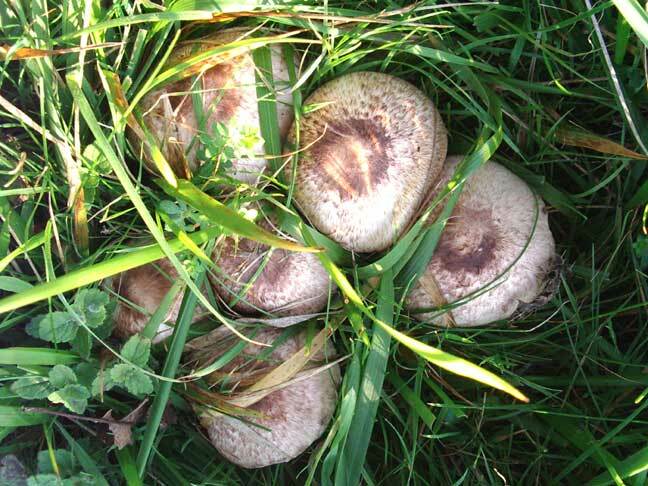 A fungal foray to Lancing Clump produced an appetising (but not tested by being eaten) large Agaricus species shown on the image above right. There were also some dried out Parasols. 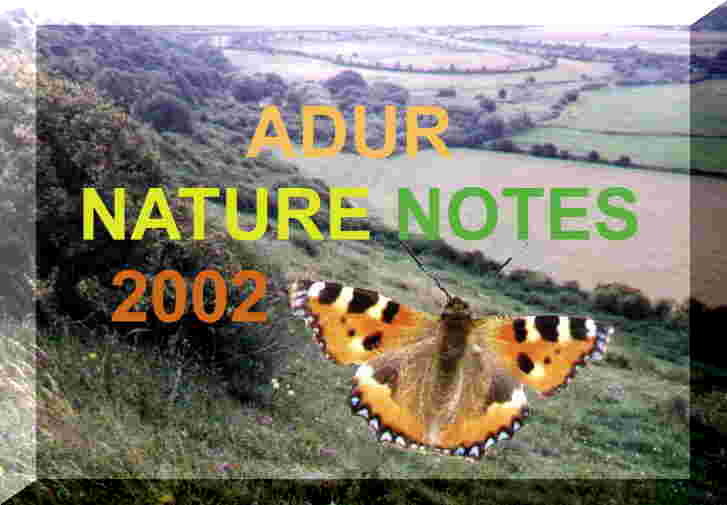 The following butterflies were seen on Lancing Ring and the surrounding meadows: one Red Admiral, one Clouded Yellow (on the western side), several Wall Browns, four Small Heaths (this is both the first record received from both the Lancing Clump meadows and for the month of October), many Whites and many Speckled Woods. Six species in a day is notable for October. 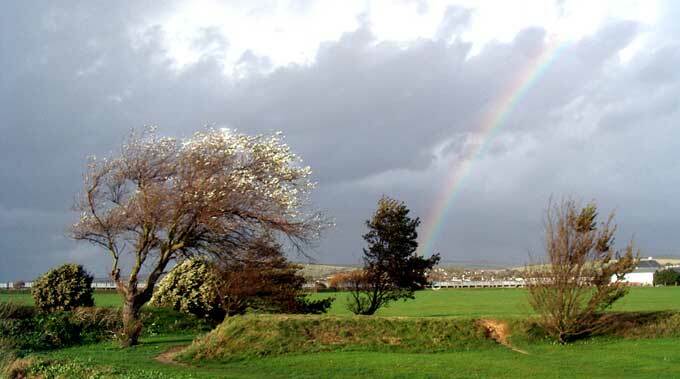 After the brief rain shower, the rainbow viewed from the southern car park at Mill Hill stretched in the distance from Beeding Hill to Mossy Bottom in the north-east. As the breeze gusted to 35 mph or Gale Force 7, the male Kestrel struggled in its hovering position over the lower slopes of Mill Hill for less than a minute before gliding off. 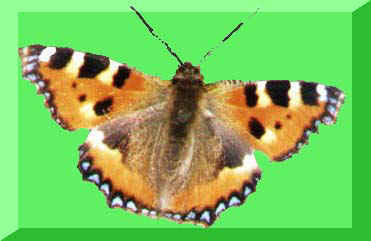 Altogether about thirty butterflies of seven species made an appearance in an hour on Mill Hill. 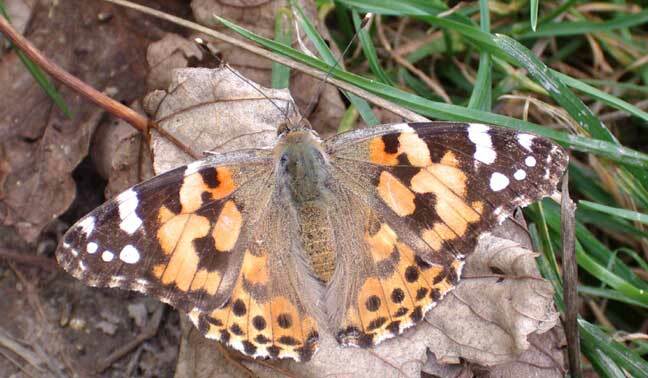 The highlights were a single faded Painted Lady on the footpath approach to Mill Hill from the Waterworks Road, and the appearance of between five and ten Wall Browns on the lower slopes. With anything fluttering in the breeze likely to be a falling leaf, there were just two butterflies seen, both good condition Red Admirals. The large bright blue banded dragonflies that I had unfounded doubts over their identity were Emperor Dragonflies as one was persistently preying on small insects at the southern end of the Waterworks Road, Old Shoreham. Against the background of an azure blue sky for the brief period when the clouds had cleared just after midday, one Crow constantly mobbed the male Kestrel that regularly hovers over the lower slopes of Mill Hill. At this time of year, I only visit the lower slopes of Mill Hill, which means traversing the slightly muddy (after the rain) southern approaches where two Red Admiral Butterflies were seen. The lower slopes produced six of the eight species of butterfly on the day, the most spectacular being a dazzling bright Clouded Yellow. 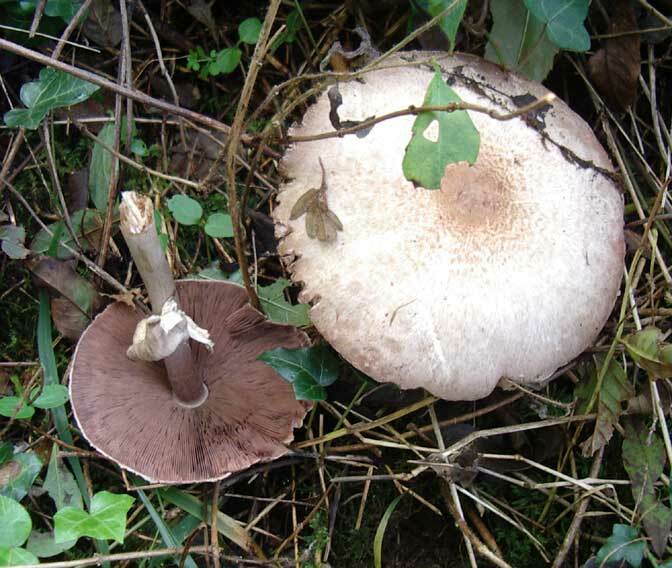 The designated footpath (between the Waterworks Road and the Steyning Road, Old Shoreham) produced a solitary mushroom amongst the leaf litter of Field Maple. It stood upright about 80 mm above the ground on a hidden root in the middle of the path. It gills were white and it measured 55 mm in cap diameter. This species is the Rooted Shank, Oudemansiella radicata. 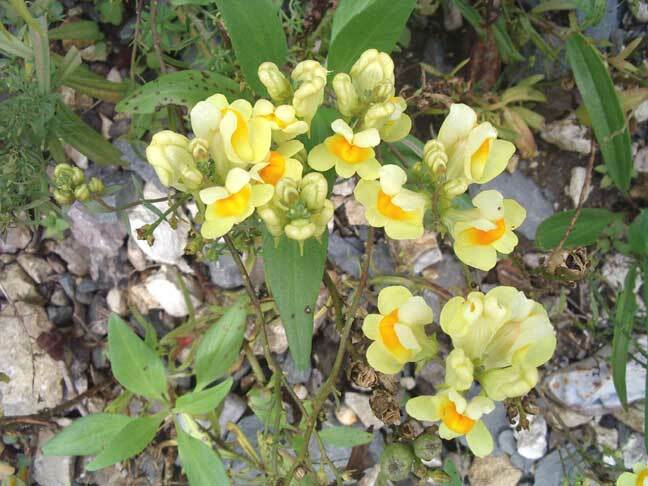 Common Toadflax, Linaria vulgaris, in flower now, a yellow plant seems common everywhere this year on waste ground, next to footpaths and even on the chalk banks of the River Adur south-east of the Toll Bridge at Old Shoreham. 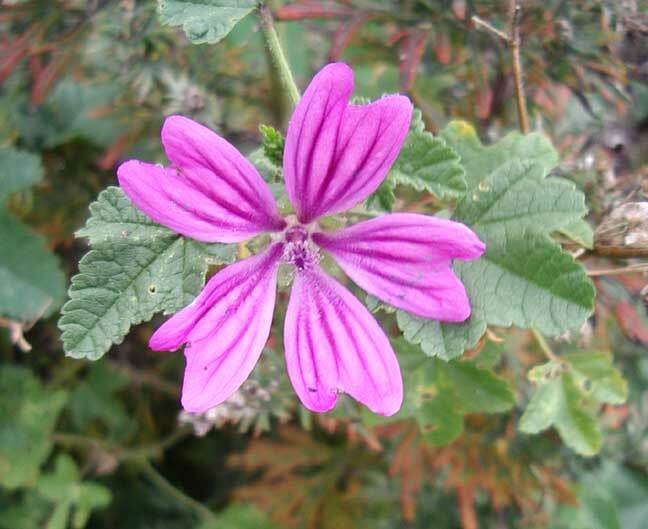 Common Mallow is still in flower, and this is a common and easily noticed plant on similar waste land, but although still common, it appears to have declined in the last few years. 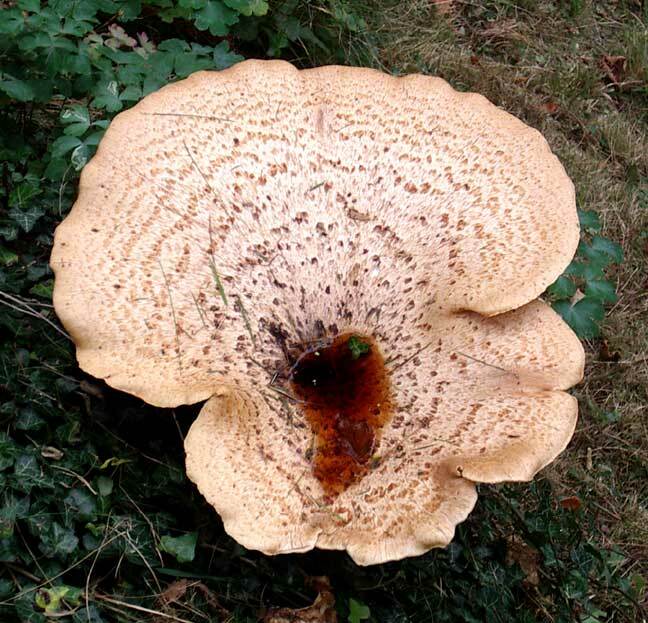 A huge toadstool has grown on a tree stump in Mill Hill Road, Old Shoreham. It measured 45 cm in length. 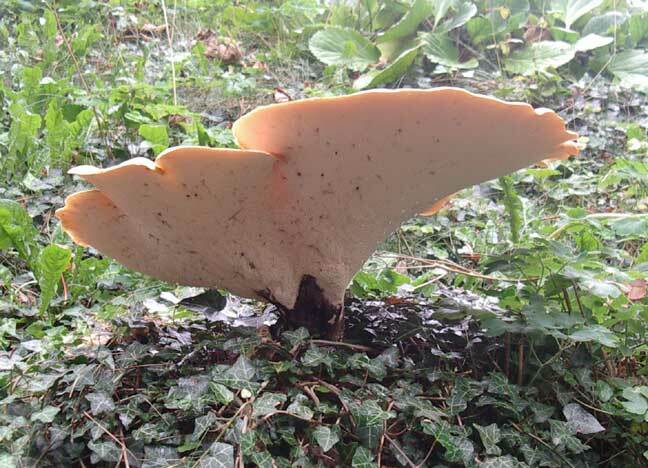 This is the Dryad's Saddle, Polyporus squamosus, and it has been seen before in the same location. 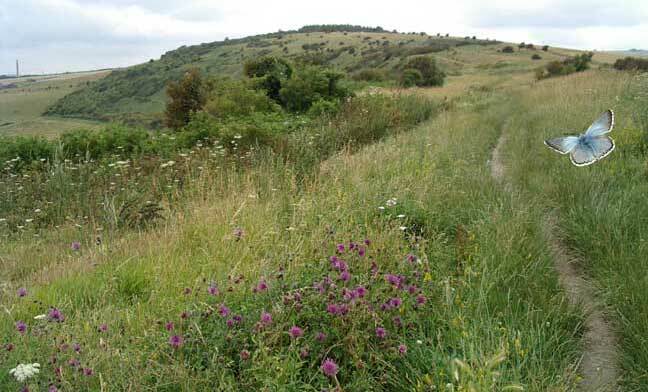 There were just four species of butterfly on the lower slopes of Mill Hill. If it was an Adonis Blue Butterfly, and this seems likely, this would be the first one I have recorded in October.